Forget Coldplay and think cold fusion: Albert Einstein, the world's best-known scientist, is hitting the Glastonbury music festival this summer. A group from the University of the West of England will show how his ideas relate to music, including the inner workings of Rolf Harris's didgeridoo. The show is part of Einstein Year, marking the centenary of three of his greatest scientific works. The aim is to make festival-goers as "passionate" about physics as music. 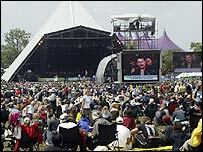 Project leader Dr Karen Bultitude said: "Einstein would have enjoyed Glastonbury. He wasn't one just for putting his theories together in the lab - he liked to get out and about. "I'm not sure whether he would like the mud, so he would be hoping for good weather, like the rest of us." Members of Glastonbury's 130,000-strong crowd will be asked for their opinions on physics and asked to contribute to a visual display. Hungover ravers will be glad to learn that scientists are also to explain the secrets of headache tablets. Dr Bultitude: "People at Glastonbury seem to be very open-minded. It's a bit 'out there' going to the festival with this, but it should have more of an impact than if we went to a genteel 'picnic in the park' concert. "There will be a strong musical element to the performances to reflect the nature of the festival, with engaging music-related tricks - such as a simple music amplifier or a didgeridoo made of plastic tubing - to demonstrate that you don't need a lab coat or a PhD to enjoy the fun of physics." Einstein had a Beatles-like period of productivity 100 years ago. 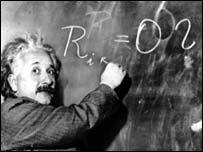 Within a few months he published his papers on the photoelectric effect, the theory of heat and "special relativity". But he was also a keen violinist. Glastonbury, which runs from 24 to 26 June, will feature acts including Van Morrison, Coldplay, Kaiser Chiefs and Basement Jaxx.